In short, Akamoji is the opposite of Aomoji is. It is a style popular among women who must adhere to the standards set by the workplace and school. Yet at the same time, being as fashionable as they want. They are always on the trends of what’s new and hot. It has been around since the 70s and as such has evolved with the times, suiting the young women of each generation. 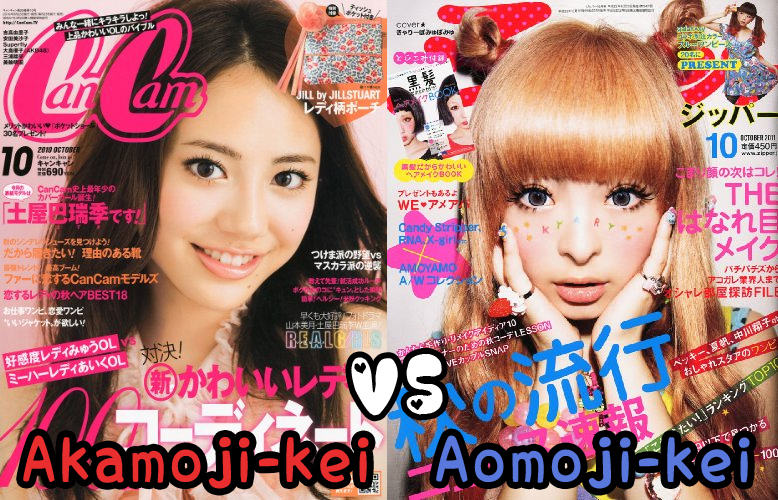 The magazines that are part of Akamoji are JJ, Ray, ViVi, CanCam and the now suspended PINKY. While the title of JJ, CanCam and PINKY where red, Ray’s and ViVi’s were pink. These magazines all go on sale on the 23rd of each month (unless it’s a national holiday then it’d be push forward a day or two earlier). The magazines carefully choose what they model should wear. Likewise most of the models have brown or black hair and where natural make-up. Even though it’s not the shining star that it once was, this subculture isn’t without its popular icons. Which include Rola, Suzuki Emi, and Nozomi Sasaki. Rola first started as a model for the gyaru magazine, Popteeen. However she later became a model for ViVi in 2008, in 2011 she skyrocketed as a TV personality and made a singing debut. Suzuki Emi is a Chinese-born model and worked with Seventeen and PINKY. While mysterious when it comes to her private life, she was not short on acting jobs. Lastly Nozomi Sasaki who also started out with PINKY became popular around 2009 and is currently working hard in not only modeling but acting, tv appearances (and occasional song release). Below I’ll show you some examples of Akamoji fashion to give you a better understanding of the look. A street snap from an Akamoji magazine. As one can see, soft colors are a common trait as well as dark hair. Kyary Pamyu Pamyu in Akamoji style. As you can see this is a drastic change. They have toned down her use of blush. She’s wearing a soft and cute blouse/dress. Her usual blonde/pastel hair has become brown with thicker eyebrows to match. Even her eye make-up has been more natural. This is the best example to show how night and day Aomoji-kei and Akamoji-kei is. A cute and feminine look, matched with a classy bag. This bound to stir a man’s heart. I hope that this helped you all understand the style better. There is not a lot of in English on this style, so I hoped to explain it better. If you have any questions about it, feel free to comment below. Thanks to Popsister and Jfashionmagazines for the magazine scans. Nice! Thanks a lot for the post. I'm definitely a fan of Akamoji, I just love the pretty but mature look it gives.